So my 5 month old iPhone 6, 16gb, updated to ios 9.2.1 recently showed random filling up of storage space. No new apps or photos or music of any kind is being added and yet the storage space keeps on decreasing randomly over time. When I connect to iTunes, the storage bar at the bottom of the screen shows a huge purple bar that’s taking up a lot of space, labelled “DOCUMENTS AND DATA”. Now, is this a new deal? ‘Cause I don’t recall seeing such high amount of space being occupied by this purple thing before yesterday. What the heck is up?! People try everything including backing up and then restored the phone with iTunes, but more often than not that’s only a temporary fix! Everything goes back to normal and the storage space shows 4.4GB (for example) free. Over a few hours, the storage space then keeps decreasing randomly (probably losing 500MB per hour) until the storage space decreases to 0 bytes, you get the normal pop up messages about insufficient storage. 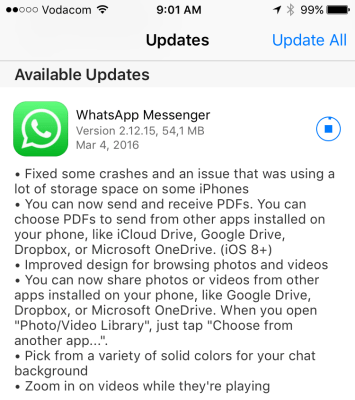 Basically the problem arose when WhatsApp released an update to their app on or about 29 February 2016. If you were running iOS 9.2.1, there was a good chance that your phone started acting up. But if your iPhone has 0 bytes free you’ve got a problem, because you won’t be able to download and install the new version of WhatsApp, and you also won’t be able to backup your iPhone OR restore it. So what do you do? That should sort you out! Download and install PhoneClean onto your computer. Run it and perform a scan on your iPhone to clear up some free space. Then download and update WhatsApp as fast as you can. Read more on Apple’s discussion forum here or here.